You’re sitting at the table eating something crunchy, when suddenly, you feel a sharp pain and discover your tooth has broken. Don’t panic, it’s OK. Broken teeth are only one of many reasons why a person would need dental crowns and seek out a professional in Kanata Dentistry. Dental crowns provided by Kanata dentistry professional are caps that go over teeth to help improve their look and size, as well as provide additional protection. When you wear a crown, it completely covers the visible portion of the tooth. Dental crowns come in many types that you can choose from including stainless steel. Stainless steel crowns are a stop-gap measure to temporarily support the tooth while a more permanent is fitted and made. Dental crowns can be made of many different types of metals including gold, palladium, nickel and other alloys. Metal crowns require less tooth to be removed and relieves wear and tear on the other teeth. They are incredibly strong and last a long time. The primary issue with metal crowns is they don’t blend in with the other teeth. Kanata dentistry professionals can make sure porcelain and resin crowns can be matched to the color of the other teeth, but they do cause additional wear to surrounding teeth and are not as durable as metal crowns. They are more likely to chip or break as well. These are especially popular for front teeth. Porcelain-fused-to-metal crowns are the best of both worlds. They have the durability of metal crowns with the color matching capability of the resin and porcelain crowns. The primary drawback for these types of dental crowns is the metal may sometimes show at the base, especially if the gums recede. When it comes to Kanata dentistry, dentists are more than capable of providing dental crown services. They are mainly used in cases where the tooth is broken or is weak from decay. It’s also used as a way to hold a dental bridge in place. If you have teeth that are discolored, then Kanata dentistry can use a crown to cover it and match the rest of your teeth. There are many valid reasons for getting a crown both medical and aesthetic. They have become a common part of Kanata dentistry. 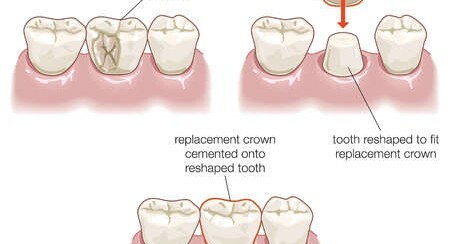 Dental crowns require two visits to your dentist. The first examines and prepares the tooth for the crown and the second is actually placing the crown on the tooth.